When Elder Watson Diggs arrived on the Bloomington campus in 1910, he was one of 10 African-American students who were enrolled at IU. Six years later, he became the first African-American to graduate from the School of Education. In honor of Diggs’ legacy and the centennial anniversary of his historic graduation, the IU School of Education recognized three IU students with an inaugural Elder Watson Diggs "The Dreamer" award. The award was developed by Christina Wright Fields, director of the School of Education’s Balfour Scholars Program and Stephanie Power-Carter, associate professor of literacy, culture and language education and former director of the Neal-Marshall Black Culture Center. “As African-American educators, Dr. Power-Carter and I understand firsthand the challenges students from underrepresented and marginalized backgrounds face as they pursue postsecondary education,” Fields said. “We were inspired by Diggs’ story and contributions and wanted to ensure Diggs’ legacy was preserved. We worked collaboratively to devise a way to honor him and educate others of his accomplishments through a formal recognition of the Elder Watson Diggs 'The Dreamer' award." In 1911, at a time when African-American students were not allowed to live on campus, Diggs was unhappy with the way black students were treated and set out to improve academic and cultural opportunities for them on campus. He helped found Kappa Alpha Psi, one of the earliest black national social fraternities established in the United States. “IU’s School of Education’s Balfour Scholars Program helps increase higher education access and success for underrepresented and marginalized students which greatly relates to Elder Diggs' legacy of providing opportunities for historically underrepresented students,” Fields said. 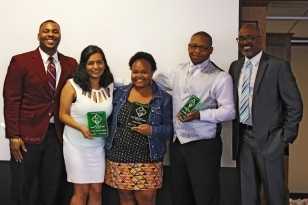 The three students who received the award were Estefani Alcaraz Quevedo, Ramir Williams and Janai Weeks. They are all participants in the School of Education’s Balfour Pre-College Academy, a free program that helps high school students from underrepresented groups with academic and career development. Each winner represented a corresponding cohort from 2013, 2014 or 2015. “These Balfour Scholars chosen epitomized the resolute character of Elder Diggs and exhibited ‘dreamer’ qualities, whether it was being a first-generation college student, inspiring their peers or mentees to pursue academic excellence, or being an engaged campus leader to facilitate positive change on campus and their surrounding community,” Fields said. For Quevedo, a junior studying accounting and finance, receiving the award was an emotional experience. While "The Dreamer" award is currently for Balfour participants, in the future it may be expanded to others in the School of Education, including staff, faculty or graduate students who work to improve academic success and access of historically underrepresented and/or marginalized students. The Elder Watson Diggs "The Dreamer" award aligns with priorities outlined in the university’s Bicentennial Strategic Plan, including a commitment to student success.